This post is done in honor of a special little girl that I learned about from Simon Says. They have been doing a card drive for her, so I have made this card and will pop it in the mail and send all my prayers and wishes that this bone marrow transplant will work this time for her. You can learn all about her story by clicking here. Hopefully you can make her card and brighten her day. I hope this one will. This card is made with an image from Whimsy Stamps called Morgan from designer FairyDust Images. This is my inspiration card that will hopefully inspire you to make a card for Maddy as well. A closer look at the colored image she is carrying a sword and is standing strong just like Maddy is. 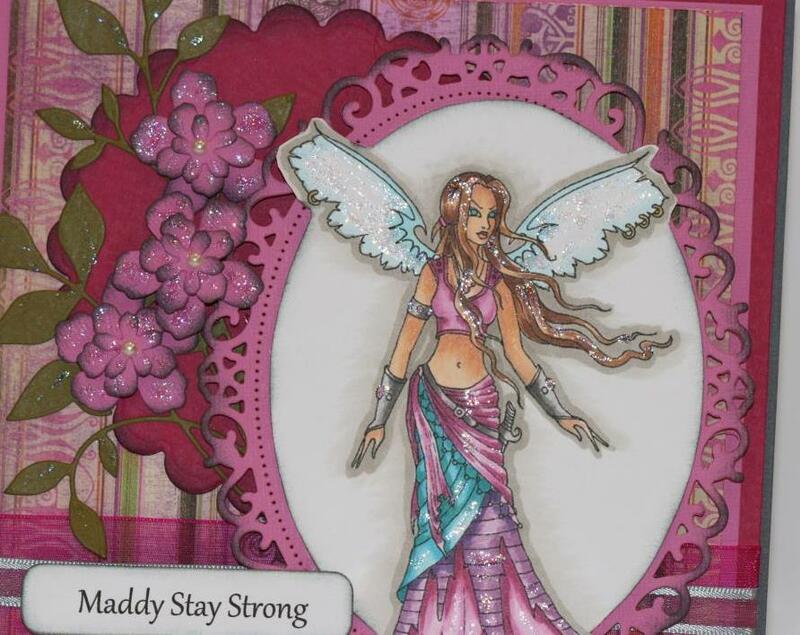 I hope that you can make a card for maddy as well. Nicely done beautiful coloring and sparkle! Awesome cause and prayers go out to her! Beautiful! So pretty! Thanks for playing along with us at the Simon Says Stamp Challenge this week!